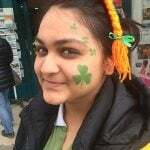 Natasha, from India, is a first-year student studying International Finance and Economics at Maynooth University. She loves animals, playing sports and reading books. Mount Tibidabo was the best highlight of my trip! We started off by getting a taxi to the top of the mountain, as unfortunately, the trams that go up the mountain weren’t running that day. However, the taxi driver was such a lovely man and told us a lot about the place he came from, Catalunya. When we reached the top, we were taken away by the architectural beauty of the church that is situated at the top of the mountain (it is called “Temple Expiatori del Sagrat Cor”). The church was very charming on the inside as well. But, it was the view from the top of the terrace of the church that truly took my breath away! The view was absolutely gorgeous and to top it all off, the weather was amazing as well. We could see all of Barcelona from there. This structure was another absolutely amazing architectural structure. But what I loved about it was the inside of the church. The environment was very calming. A man played hymns on the piano which echoed throughout the well-lit interiors of the church. Regardless of whether you’re religious or not, it definitely is a must-visit destination for all. Beaches are always a great place to visit in countries, and Barceloneta beach was no exception. We loved it so much that we went twice! Not only do you get scenic views of the beach, but you get to see the locals out and about. You will see loads of people displaying their talents for spare change. It really is quite an entertaining place. This is a very renowned food market in Barcelona. My friends and I loved it because we are such foodies and this market satisfies all your foodie desires. The variety of fruits that they sell is absolutely amazing! In Ireland, I personally missed the tropical fruits like mango and coconut that I used to eat back home. So I bought all the fruit I could possibly manage to carry haha! There were also stalls selling seafood, chocolates, spices, empanadas and so many other food items! This park was full of natural beauty. My friends and I took loads of pictures! The best part of this park was, of course, the maze. To solve the maze, we had to walk and find the heart of the maze, which has a beautiful statue. Then we had to find an alternate way out of the maze. This was so much fun to do and took us about 15 minutes (which wasn’t too bad frankly). We were quite proud of ourselves haha! So that was a very very summarised version of my trip to Barcelona. I had such an amazing time with my friends! I encourage all international students to use your holidays to travel around Europe as flights are so much cheaper from Ireland and it’s a great way to spend time with friends.